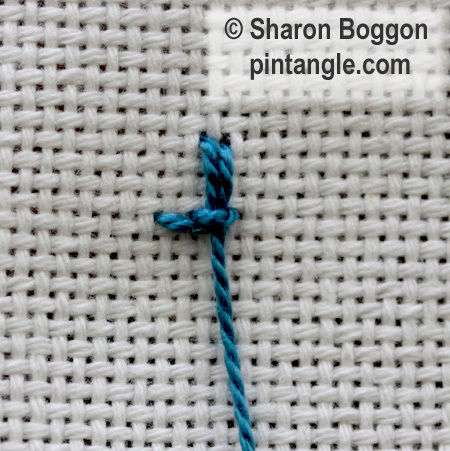 Work this stitch from left to right and be familiar with the regular form of Up and Down Buttonhole stitch. 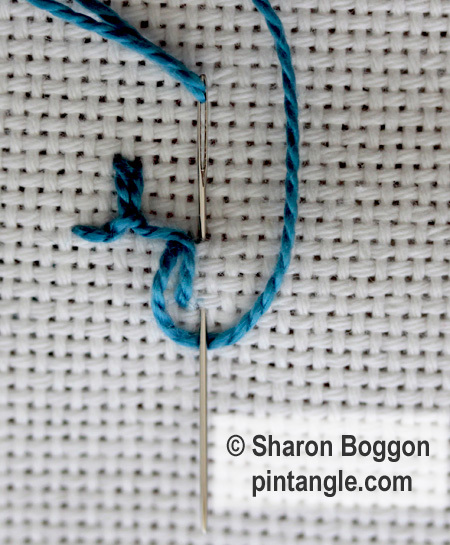 Starting as you would with buttonhole stitch and with your needle pointing downwards wrap the thread under the needle and pull the needle through. 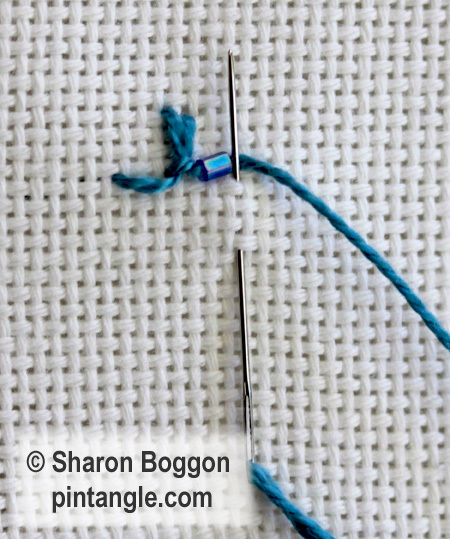 For the second part of the stitch, insert the needle and take a bite of the fabric so that the tip of the needle is pointing upwards as illustrated. Wrap the working thread under the needle and pull the needle through the foundation fabric. As you pull the needle through pull the needle towards you instead of away from you. As you do this hold down the loop that forms with the left thumb to prevent it slipping. This loop forms the bar at the base of both stitches. For regular up and down button hole you would work along the line at this point. Note I have noticed online that some instructions create a loop then lace the working thread through the stitch. This is lets say a creative way of doing it and is technically incorrect as the loop is created as you stitch and once you have the rhythm of the stitch it is easy and quick to do. 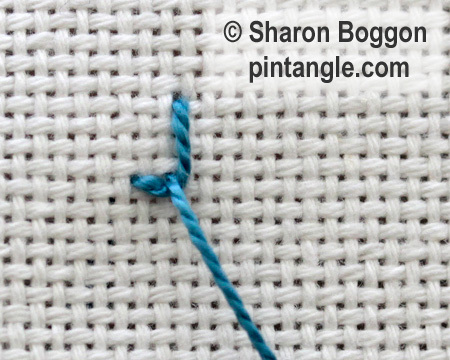 For Alternating Up and down buttonhole stitch, you work the next pair of stitches pointing in the other direction. 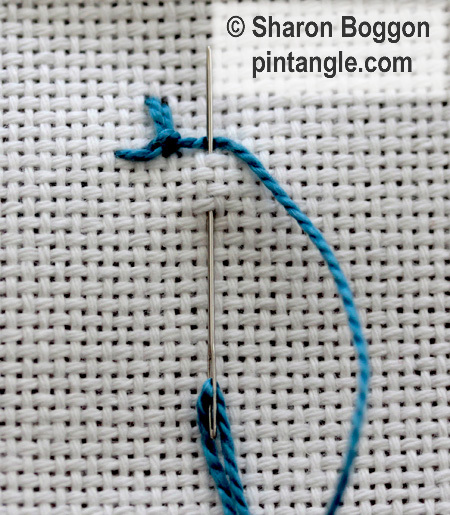 Once again make a regular buttonhole stitch but this time point your needle upwards wrap the thread under the needle and pull the needle through. 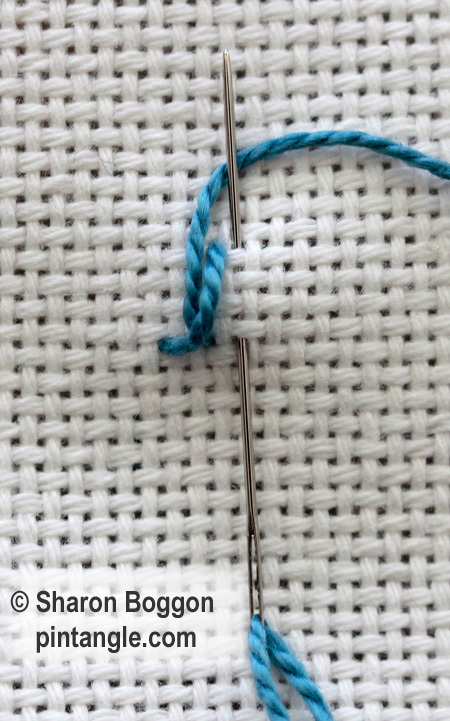 For the second part of the stitch, insert the needle and take a bite of the fabric so that the tip of the needle is pointing downwards as illustrated. As you pull the needle through pull he needle away form you and hold down the loop that forms with the left thumb to prevent it slipping. This forms the second pair of stitches. 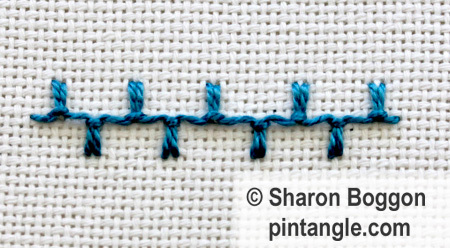 Continue along the line with alternating the direction of each pair of stitches as illustrated. This time I managed to tame the stitches on a curve! Hi Chitra I took look at your stitch samples I really like the way you are using them! As an experiment,alternating up and down buttonhole stitches were worked on some shapes and curves on my sampler. I have finished samples for Nos. 126 and 127. It is a great pair of stitches to do and I intend using them more often. Thanks again Sharon for taking time for us when you have such a busy year happening. Here is stitch 125 beaded herringbone, very plain but it makes a nice band. Thank you for sharing! I already have ideas for ways to use these two stitches! This week I tried out the whipped wheel and the beaded herringbone stitches. Almost up to date. Here are samples 122, 123 and 125. Thank you so much for youre generosity!!!!!!! !